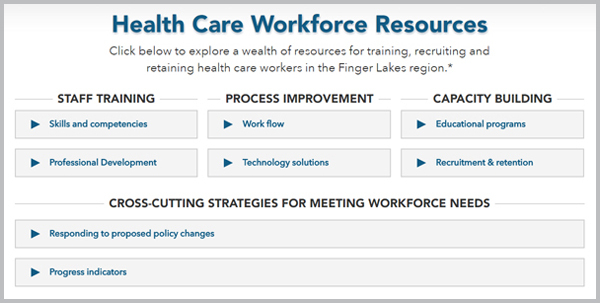 A new online library of workforce resources for local health care providers launched this month on commongroundhealth.org. The library shares information on training, recruiting and retaining workers in the nine-county Finger Lakes region. “Preparing for the future of health care is critical,” said Anne Ruflin, chief planing officer of Common Ground Health, which convened the Regional Consortium on Health Care Workforce that commissioned the project. “This online library will speed the adoption of best practices and give colleagues a one-stop resource for learning about local programs and training opportunities.” Learn more. 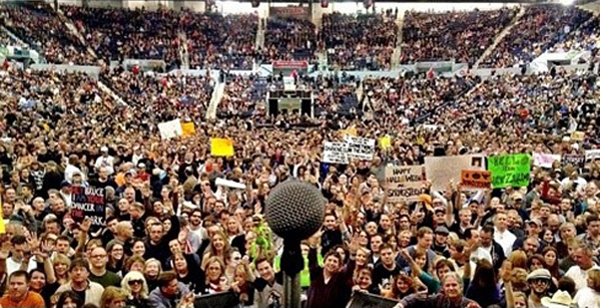 Photo of Bruce Springsteen Blue Cross Arena concert by Lef Carroll. Used with permission. Over the past five years, the percentage of adults in the Finger Lakes region who have their high blood pressure under control has increased 4.5 percent. Based on hypertension estimates, that improvement in control rates translates to 15,891 additional individuals in our nine county region who have lowered their high blood pressure to 140/90 millimeters of mercury or less. For the record, that’s more people than have ever filled Rochester's Blue Cross Arena. The good news is part of our latest high blood pressure registry report, which contains data on 64 percent of hypertensives in our region. Learn more. Thumbs up to Ontario County Public Health for its hands-on support of produce gleaners with the Geneva Food Justice Coalition. Public Health Nurse Teresa Shaffer co-chairs the coalition, which this year picked 18,000 pounds of leftover farm produce to give to groups needing nutritious food, including residents of a designated food desert in Geneva. “It is inspiring to see a public health department thinking so creatively about addressing the health and well-being of its community and supporting grass roots efforts that make a meaningful impact on people’s lives,” said Anne Ruflin, chief planning officer for Common Ground Health. Learn more. In a recent Common Ground analysis, many low-income residents reported that transportation challenges prevented them from accessing needed health care. So it’s important for residents and organizations to share feedback with Regional Transit Service (RTS) on possible changes to Monroe County’s bus route structure. Residents can provide suggestions through an online survey, which asks participants to identify priorities, rank route structures and show the locations of important destinations. Find other ways to comment on the Reimagine RTS study here. Recommendations will be released by December 2018. Sign up here to get updates from RTS. 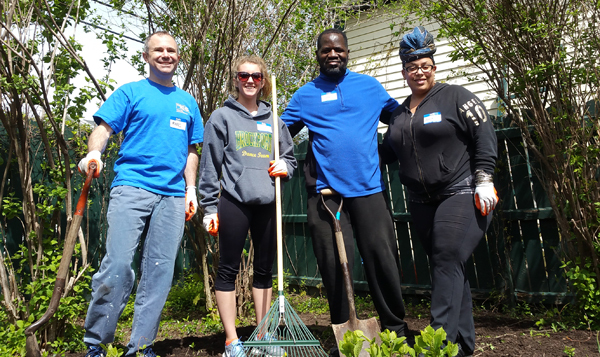 Common Ground Health staff pause for a picture during the 2017 Day of Caring. Common Ground Health was certified as a great workplace for the second year in a row, based on an anonymous employee survey by independent analysts at Great Place to Work®. In that survey, 95 percent of employees said they feel good about the ways they contribute to the community. Learn more. View our job openings. Our community partners have increasingly identified the need to focus on behavioral health, particularly in children. That is why we were excited to hear about the University of Rochester’s new Pediatric Behavioral Health and Wellness Center. “Rochester still leads the country as a beacon of high performance on cost and quality,” wrote Ian Morrison in Hospitals & Health Networks, a publication of the American Hospital Association. He credited several of our initiatives for that success, including the Community Technology Assessment Advisory Board, the 2020 Commission and our clinical innovation and high blood pressure projects. Read the column. Dina Faticone, director of community health and engagement, along with Parent Engagement Specialist Erick Stephens and Policy and Research Associate Jenn Beideman talked about Healthi Kids' initiatives on CityWise, the City of Rochester's weekly talk show. See the interview.